ISOTeam (“ISO”) caught my attention. Despite sitting on a record order book, ISO has tumbled approximately 44% from an intra-day high of $0.385 on 10 Apr 2018 to close near a four year low at around $0.215 on 10 Jan 2019. The share price decline was attributable in part to its 4QFY18 surprise loss announced in Aug 2018 (financial year ends in Jun). Nevertheless, my gut feel is that 4QFY18 should mark the trough in earnings and results should improve on a quarter on quarter basis in the next few quarters. 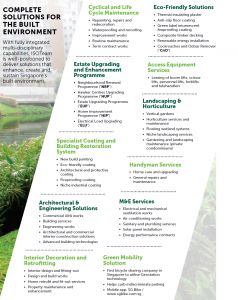 ISO has grown from a company doing repairs and redecoration (“R&R”) & addition and alteration (“A&A”) projects in 2014 (when I first met them) to a multi-disciplinary company which provides complete solutions to the built environment. See Figure 1 below for its business segments. In FY18, there were less R&R projects put up by the town councils for public tender last year with more L2-grade jobs in the $1-2m range, which is a highly competitive space with many smaller players competing on prices. Amid the heightened competition, ISO has initially been resistant in changing its bidding strategy for R&R projects so as to maintain its gross margins for R&R projects to be above 20%. However, with the loss incurred in 4QFY18 (Apr – Jun), management has decided to change their bidding strategy by lowering their gross margin requirement by a few percentage points. Nevertheless, they believe that such change is necessary and beneficial for the group as a small sacrifice in margins is likely to bring about a significant increase in volume of R&R projects secured. This change in strategy is apparently successful as ISO announced on 19 Nov 2018 that they have clinched seven R&R projects worth S$10.8m. On 9 Jan 2019, ISO announced a further three R&R contract wins amounting to S$9.8m. Overseas projects in Myanmar and Malaysia have incurred some losses in FY18. ISO has since reduced the headcount and has altered its strategies. For Myanmar, ISO is working with Singapore developers who want to develop projects in Myanmar. With Singapore developers, it is easier to do business and payment collection is easier too. For Malaysia, ISO has also significantly reduced its headcount. Together with its joint venture partner, they plan to change strategy to develop boutique project (i.e. develop a small piece of land with 50-80 units and sell à its partner’s forte) or / and manage foreign worker dormitory (ISO’s forte). As of now, both Malaysia and Myanmar businesses have stabilised. ISO’s SG bike is one of the three bike companies (the other two companies are Chinese firms Mobike and Ofo to be awarded a full license by LTA. ISO has seen encouraging signs from SG bike. In fact, it has broken even in Oct 2018. Together with its partners, ISO intends to roll out family bikes in 1Q2019 along the parks to capture another segment of the market. In addition, SG bike may perform better in 2019 as Ofo seems to be having problems with cash flows, customer refunds etc. Furthermore, GrabCycle, one of the three companies to be awarded a sandbox licence, has decided to give up its sandbox licence. In short, although it is unfortunate that ISO posted a 4QFY18 loss in Aug 2018, management views it as a “timely wake-up call” to all ISO workers to do their part to reduce cost, while not affecting quality. In this aspect, management is confident that all of their interests are in line with ISO’s shareholders to reduce cost, improve earnings while not affecting work quality. With reference to its annual report (see Chart 1 below), its order book size is usually on average S$93.6m. However, it has recently been winning contracts. In the short span of less than two months, ISO has announced S$72m worth of contracts from 19 Nov 2018 through 9 Jan 2019! As of 9 Jan 2019, ISO’s order books have reached S$143m, the highest since the Group’s inception more than twenty years ago. This is approximately 1.7x of its FY18 revenue. ISO has participated in the bidding for 2 HIP projects, one of which is known and announced on 2 Jan 2019. On 2 Jan 2019, ISO announced that it won its 2nd HIP project worth S$26.3m (its first HIP project clinched on Jan 2017 was around S$17.5m). My understanding is that the other HIP contract (in the bidding process) encompass three to four precincts, hence it is reasonable to assume that the contract size may be larger. However, there is no certainty that they may get the other HIP contract. Besides the size of HIP project being larger, the number of HIP projects is likely to increase significantly due to two new developments. Firstly, HIP I has been expanded to include HDB blocks that had been built prior to 1997. Management believes this will open up opportunities for another 230,000 flats, equivalent to approximately 30 HIP projects a year! Secondly, the introduction of HIP II for flats which are 60-70 years old will open up another large pie for them to tender in the long term. As the flats will be older then, there may be more areas to upgrade which may naturally result in the contracts to be larger. Management observes that there is a visible increase in R&R projects being up for tender. At a dialogue held as part of a welcome dinner at the inaugural Bloomberg New Economy Forum in Singapore in Nov 2016, our Prime Minister Mr Lee said it is always possible to bring the election forward (earlier than Jan 2021). Based on past observations, there seems to be an increase in R&R projects, or other projects up for tendering, ahead of the election. As ISO works with all 16 town councils in Singapore, this stands them in good stead when it comes to project bidding. Based on an article on The Edge, Sunseap is building one of the world’s largest offshore floating photovoltaic (OFPV) systems to be located north of Woodlands Waterfront Park, along the Straits of Johor. Based on 9 Jan 2019 announcement, Sunseap has awarded the S$11.3m offshore floating solar project to ISO, comprising of the supply, design and installation of Offshore Grid-tied Solar Photovoltaic Systems. This is a milestone for both Singapore and ISO. The success of this project (to be completed by Sep 2019) is expected to open similar opportunities locally and around the region. In May 2018, ISO announced that it was awarded its single largest contract amounting to $46.5m from a leading integrated resort group with expected completion on Mar 2019. If they can successfully complete such a large contract on time, it may open doors to other contracts of such nature. ISO has just consolidated all its operations by shifting to Changi North in Apr 2018. Cost savings, stemming from venue rental, dormitory costs, reductions in operational and administrative expenses are likely to be seen in FY19F onwards with greater savings likely seen in FY2020 as ISO continues to streamline its operations. Cost savings may be around S$500K – S$1M on a steady state basis. In addition, ISO is exploring the possibility of closing down, or streamlining certain business units because of duplication in capabilities. They are also exploring avenues to improve productivity through job redesign and retraining, as well as investing in talent by upgrading the skills of workers who have performed well. Based on its annual report 2018, management plans to unlock value by selling two properties at Kaki Bukit and Serangoon. Such sales if materialise, may result in an approximate S$3m gain. ISO announced on 25 Sep 2018 that it has entered into a collaboration agreement with Thai company Centerlise, to exclusively distribute and install Centerlise’s air centre hardware and equipment as well as its software systems locally. Based on ISO’s press release, Centerlise’s advanced algorithm cloud-based software automatically fine tunes air conditioning and water systems resulting in up to 30% in utility savings while maintaining optimum performance. Its application is compatible with any building with central air conditioning or chiller plants. Management believes that energy-saving solutions are highly relevant in this time and age amid climate change, and they are already seeing some encouraging response from potential customers. 6.Sunseap – potential IPO in 2019? ISO has invested S$5 million into Sunseap via its Series C preference shares in May 2017. Based on an article published in South China Morning Post on 9 Aug 2017, Sunseap has plans to do an IPO as early as 2018. Should Sunseap IPO in 2019, ISO may be able to get good returns from its investment. In view of its bright industry prospects and potential new revenue streams, valuations seem undemanding for ISO based on Price to Book (“P/BV”). Based on Figure 2 below, ISO is trading at 1.0x P/BV vis-a-vis its 5-year average P/BV of around 1.9x. My personal view is that PE may not be such an accurate representation as 4QFY18 registered a shocking loss which resulted in FY18 net profit to be extremely low. With reference to Chart 2 below, ISO is trading near 2014 lows. Chart is bearish with the down sloping exponential moving averages. However, indicators such as RSI, MACD and MFI are exhibiting bullish divergences. ADX closes at 16.9 amid positively placed directional indicators, indicative of a sideways trading pattern. My guess is even though chart is bearish, it may not drop too much given the low ADX and bullish divergences from the indicators. However, as ISO is extremely illiquid, it is extremely tricky to have an accurate picture. Thus, I will like to emphasise the above chart analysis is just a rough guide only. As usual, there are many risks involved, especially in small caps. In my opinion, some obvious risks are execution risk, illiquidity risk and time horizon. Execution is key to bring about the desired effects, ranging from project delivery, execution in new business segments, success in streamlining operations and reducing cost etc. Any serious hiccups in either of these areas may have an adverse effect on the company. Based on its latest annual report 2018, the top 20 shareholders have about 82.8% of ISO’s outstanding shares. Ave 30D volume amounted to around 49,000 shares only. This is not a liquid company where investors can enter or exit quickly. Against the backdrop of our volatile market, ISO may swing quite a bit if there are sudden sellers or buyers. In my opinion, even if 4QFY18 marks the trough in operating performance, it may take some time for ISO (probably a couple of quarters) to generate good results on a year on year comparison. Nevertheless, my guess is that there is likely sequential (i.e. quarter on quarter) improvement in results, barring seasonal effects like Chinese New Year. With reference to Fig 2 above, using Bloomberg’s data, ISO is trading at 32.1x PE. However, it depends on which valuation measure one uses. My personal view (I may be wrong) is that PE may not be such an accurate representation as 4QFY18 registered a shocking loss which resulted in FY18 net profit to be extremely low. To keep my write-up concise, the above list of risks is not exhaustive. Readers are advised to refer to the analyst reports HERE and ISO’s website HERE. You can also refer to ISO’s prospectus for more information on the risks etc. In addition, you can also contact ISO’s investor relation August Consulting if you have any queries regarding the company. My personal view is that amid its strong order books, bright outlook for its business segments especially HIP, R&R projects, collaboration with Sunseap and Centerlise, it is likely to be a turnaround play in FY19F with more evidence of improvement likely to be seen in 2HFY19F. Nevertheless, readers have to be cognisant of (just to cite a few) illiquidity risk, execution risk etc. P.S: I am vested in ISO and have informed my clients in Dec when ISO is trading around $0.195. Previous Previous post: Gabriel Gan: Early Signs Of Asian Bull Markets Returning?